Sit. Stay. Good blog. : Time to get coco-nutty! Last night, I made a coconut cream pie. Now, before you thinking that I've fallen off the healthy wagon, let me say that I used the recipe from Hungry Girl. If you don't know Hungry Girl, go visit her. She's terrific. Preheat oven to 350 degrees. Spray a large pie pan lightly with nonstick spray and set aside. Place cereal and graham cracker pieces in a blender or food processor, and grind to a breadcrumb-like consistency. Transfer to a medium bowl. Add Splenda and set aside. In a small microwave-safe bowl, combine butter with 2 tbsp. water. Microwave until just melted. Add to the medium bowl and stir contents until thoroughly mixed. Evenly distribute crust mixture along the bottom of the pie pan, using your hands or a flat utensil to firmly press and form the crust. Press it into the edges and up along the sides of the pan. Bake in the oven for 10 minutes. Set aside to cool. To make the filling, pour milk into a large bowl. Add coconut extract and pudding mix and whisk until smooth, about 2 minutes. Gently fold 1 cup Cool Whip into pudding mixture. Stir in 1/4 cup shredded coconut. Once crust has cooled and filling has thickened, evenly spread filling into the crust. Spread remaining 1 cup Cool Whip over the filling. Refrigerate until completely chilled and set, at least 1 hour. For a toasted coconut topping (optional), bring a skillet sprayed with nonstick spray to medium heat on the stove, and add remaining 2 tbsp. shredded coconut. Stirring occasionally, cook for about 4 minutes, or until lightly browned. Allow to cool. Just before serving, sprinkle toasted or un-toasted shredded coconut over the pie. Cut into 8 slices and enjoy! How does one make this not-terrible-for-you coconut cream pie? For starters, you nix the whole traditional pie crust thing, which is easy for me because I've never really been a traditional pie crust kind of girl. Instead, Hungry Girl makes a graham crackery-type crust (that's more my style) out of graham crackers and Fiber One cereal. 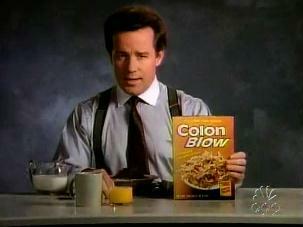 God, I miss Phil Hartman. Wasn't he terrific in everything? He was just a cave man. Anywho, I'd never in my life tried Fiber One cereal until last night. You know what? It tastes like AlphaBits without the marshmallows. Who knew? In addition to its known role as an intestinal pipe cleaner, Fiber One cereal, when pulverized with a few low-fat graham crackers and mixed with Brummel and Brown makes a pretty decent-looking pie crust. When you press the mixture into the pie pan, don't get frustrated when most of it sticks to your fingers. Just keep patting it into place, working from the center outward, then up the sides. It took a minute for me to get the hang of it, but once I did it was easy. So we made this Colon Blow crust, and baked it little to set it. Then, we mixed up a some instant vanilla pudding. HG (Hungry Girl, for those of you not on initial terms with her yet) calls for sugar free pudding mix, but since the pie is for Frank and me to share, and he doesn't do artificial sweeteners, we used regular pudding mix. To the pudding we added some coconut extract, a little shredded coconut and some fat-free Cool Whip. Then we dumped it in the cooled pie crust, topped it with more Cool Whip, and sprinkled on some toasted coconut to make it look all bakery fancy. I wanted to eat some of it last night, but resisted. This morning, Frank packed a couple of slices into to-go containers so we could enjoy our pie at lunch. It tastes like a coconut cream pie, and that's what I wanted it to taste like. I would only change one thing about the original HG recipe - next time, I'll add about 1/4 tsp. or so of salt to the crust mixture. Otherwise, this is a definite keeper.